She sat on an office chair with a thick, Pokemon index book as a seat cushion in her mother’s basement that she recently converted into an art studio. The young woman faded into the music of instrumental rock guitarist Joe Satriani as she cut and shaped several pieces of metal into jewelry. “I’m a metalhead,” Sara Thompson said with a smile during a recent interview. Literally, and figuratively, the driven 16-year-old has a love for all things metal. From her fingers and wrists to her ears and neck, she wears metal jewelry. While she works she listens to genres of metal music. The coolness of the basement is the perfect place to bring metal up to temperature, Sara said. She uses torches to heat the metal until she can easily bend and mold it into pieces of wearable art. She calls her work “abstract enameling.” Glass mixed with metal to create jewelry. 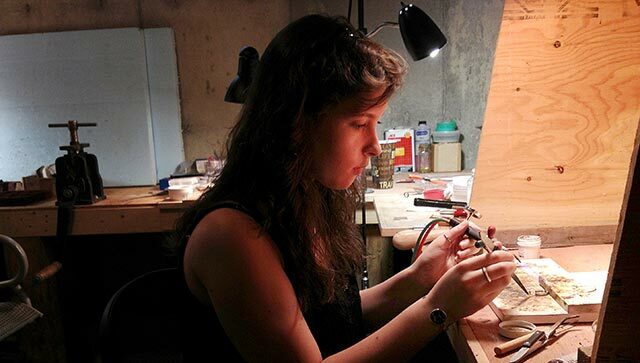 “I treat the enameling as if it were a stone,” Sara explained. “These are going to be a pair of earrings,” she said as she meticulously sanded the silver in her hand. As she prepared to solder a back to the earring she rolled several feet in her office chair to the other side of her studio, and stood up. She reached for a switch to turn on a ventilator and turned the knobs of an oxygen tank and a propane tank. Highly organized, Sara’s work space includes dozens of labeled, small bags filled with pieces of solder, metal, and different powders that add color to her work. After lighting a mini-torch, she used tweezers to precisely place pieces of solder on the teardrop and small circles. “My mother [Margie Thompson] made sure I had at least one fire extinguisher,” she said with a laugh. Originally from Coventry, Conn., Sara and her family, longtime Island visitors, moved to Martha’s Vineyard when she was 11. 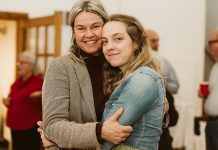 The 16-year-old graduated one year early from Martha’s Vineyard Regional High School last spring, and plans to attend Oregon College of Art and Craft in the fall to concentrate in metals. Sara plans to work towards a Bachelor’s of Fine Arts degree, and possibly a master’s degree. She received several scholarships and dreams of life as an artist. She has had a passion for art since her days of “crayons and coloring books,” but she attributes much of her creative knowledge to time spent with local artists. From the age of 11, Sara worked with Amy Kirkpatrick, an artist based in Vineyard Haven who works with sterling silver, beach glass, and other materials. Recently, she began an apprenticeship with Kenneth Pillsworth, a geometric mixed-metal work artist. She also barters with carpenter Peter Robb for scrap pieces of material, like metal, for jewelry. The young artist got her feet wet with public displays of her artwork over the past year at Citrine Beads & Imports in Vineyard Haven, the Artisan’s Festival in West Tisbury, and the Old Sculpin Gallery in Edgartown. Her reception has been warm and friendly. At 16, she believes she has found something that not only makes her happy, but could financially support her. Finding a market is one of the hardest challenges, she said, along with balancing the life of an artist and trying to run a business. Sara said she loves the endless personalization that comes with her work. “Each piece is its own unique piece, and there will never be another piece like it,” she said. Sara’s work is available for purchase during the Artisan’s Festival and at her Etsy shop.